With an AJAX-rich interface, GoingUp! 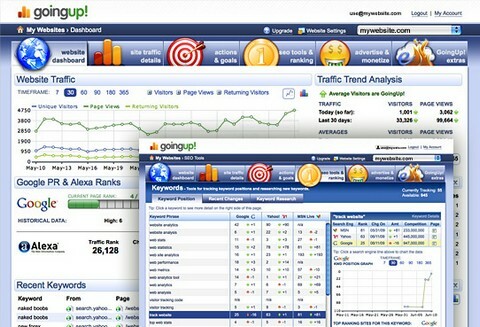 combines powerful web-analytics with top notch SEO tools. Firstly, you can get a Complete WebSite Stats, check your visitors, referring URLs and even search engine traffic. Secondly, you can also Track Keyword Positions, see your SEO efforts by graphing keyword positions over time. Thirdly, you can set Actions & Goals, set custom tracking events to see sales, downloads and subscribes. Lastly, you can easily Customize Dashboard, Show only the data you want to see with the slick AJAX interface. GoingUp! now lets you earn points while using the web analytics tracking as well. Soon, you’ll be able to use these points for premium services such as search engine promotion, keyword rank monitor and more. Plus, you can even turn your points into cash or prizes. Simply install the GoingUp! PHP tracking code on your site and your points will start to accumulate. Damn Jim.. you are right?!? How messed up is that! Maybe someone should tell Basecamp!?! Not entirely free… if you wan the SEO and other tools to function fully, you have to pay. Still looks nice… Limiting the full functionality to PHP is a bummer… why not make it open so we can use asp or coldfusion? Looks like it’d be cool, but lack of originality in the design (aka, stealing from basecamp) is quite a big turn off. But it sounds to me, its still a great tool that the guys are offering. I really like that I can track my keywords if they are going up or down the search engines. What’s with the RSS feed? It’s showing up only 1 result for me. Checked it out… looks really cool. but it’s pretty in depth. It seems more advanced than any other tools I’ve used and it’s got more stuff in one place….. I dunno, I’m gonna give it a try this week and see what happens! I can see it has a similar style to BC, did they change it maybe? I think it’s a great tool, I’ve been using it for a couple months. IMO they are really not 100% done with it, a work in progress. They have been steadily adding things to it. The keywords tracking is nice, as is the other tools. I am hoping for more detailed reporting soon. Jim, you’re right. I’ve never seen another site that uses horizontal sectioning before. I bet basecamp invented that style… they should sue. I cant get the php ranker to woork. The inbound connection doesnt pass. Thanks for sharing. Always looking to learn more on analytics and to apply it to the tool I use. Great tool! Looks promising, I will give it a try! I really liked it when I first joined, but after using it for about 3 months now, I’m less than impressed. For starters, it’s been acting up for the last couple of weeks. Half the time it isn’t even up. And when it has been up, it’s been very slow. One feature I always look for in an analytical app is the ability to see where traffic is coming from, like links that visitors have used to get to my site. Maybe I just missed it, but I don’t see that function anywhere.